Two Ingredient Marshmallow Candy...so easy to make. 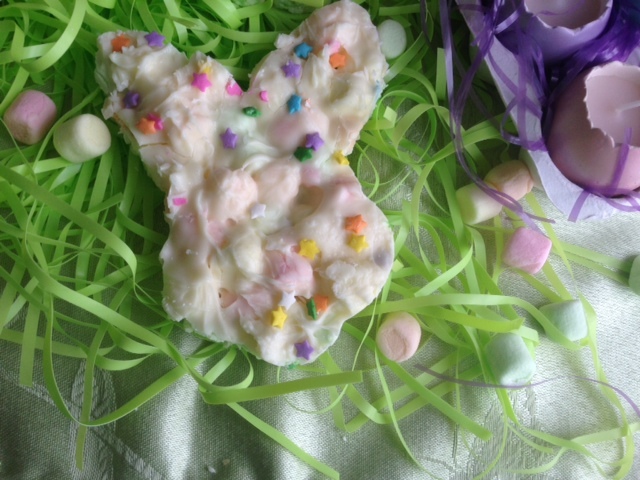 Spring Marshmallow Candy made with white almond bark or white chocolate….two ingredients that made a wonderful candy for Spring. Ok, so maybe some of you are still eating left over Valentines’ candy…I know, not all at once but maybe a piece or two a week? I am bringing back this recipe because not only is it easy to make, it is pretty too. 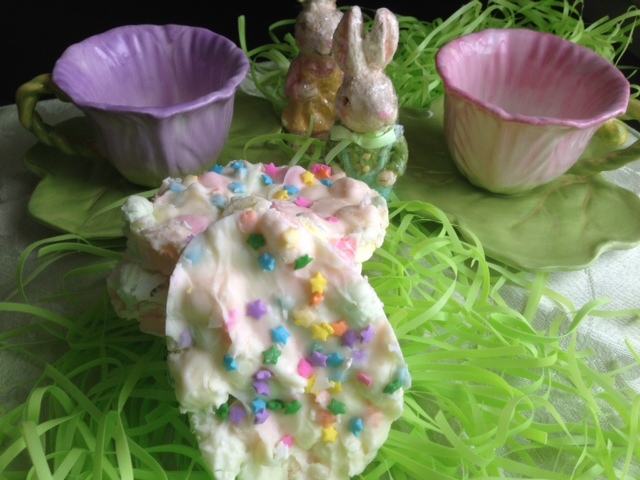 Even if you are not eating candy…you must try this easy two ingredient recipe for the cutest Easter candy ever! It is so easy…just melt the almond bark or the white chocolate chips in the microwave, add the pastel mini marshmallows.. and then spread the mixture onto a parchment lined sheet pan, add a few sprinkles… and cool. 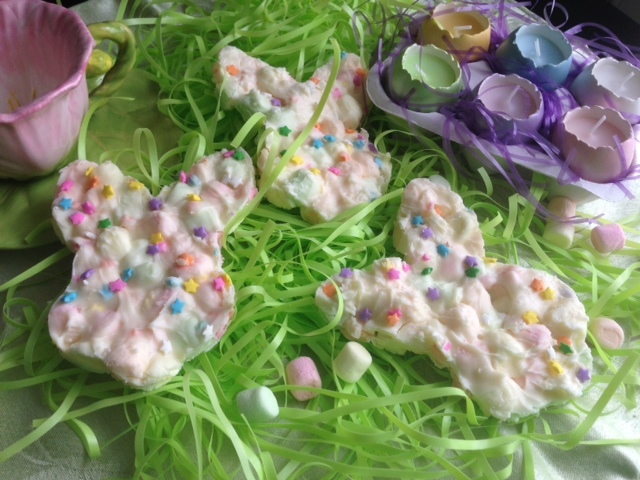 Cut into desired shapes…rectangles or bars OR you can use cookie cutters as I did and make Easter Egg and Bunny shapes! It is that easy! The kids and adults will love this candy! It just screams Spring! I make this simple recipe every year and I just had to bring it back to you, my dear readers…just in case you forgot this recipe and stuffed it in the back of your recipe file. 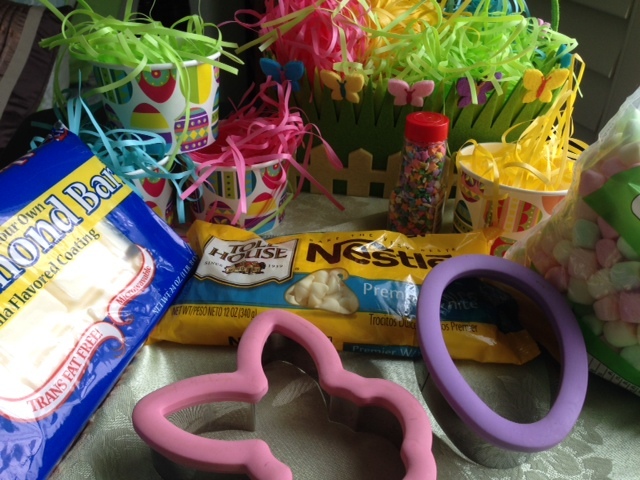 Sprinkle pastel sprinkles or even glitter….so pretty. Make sure to chill in the freezer for 30 minutes, then bring to room temperature and use metal cookie cutters to cut through the almond bark. 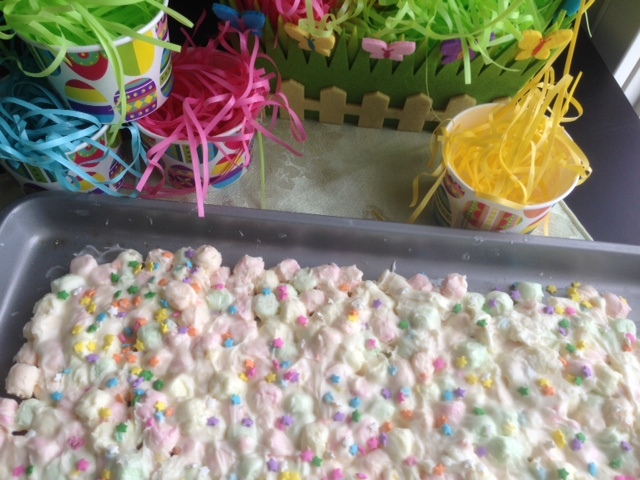 One thing to note…..if you want more of the pastel marshmallow colors to show through, spread the almond bark on the bottom of the parchment paper and sprinkle the mini marshmallows over the melted almond bark making sure it is in one layer. Be careful though, this candy is addicting! Oh my goodness! I cut Mrs. Bunny Rabbits’ ears off in this shot. Sorry Mrs. Bunny Rabbit! Makes me want to pour a cup of hot tea and munch on an egg. Well, a candy marshmallow egg. You can use the rainbow mini marshmallows which give berry type flavors. 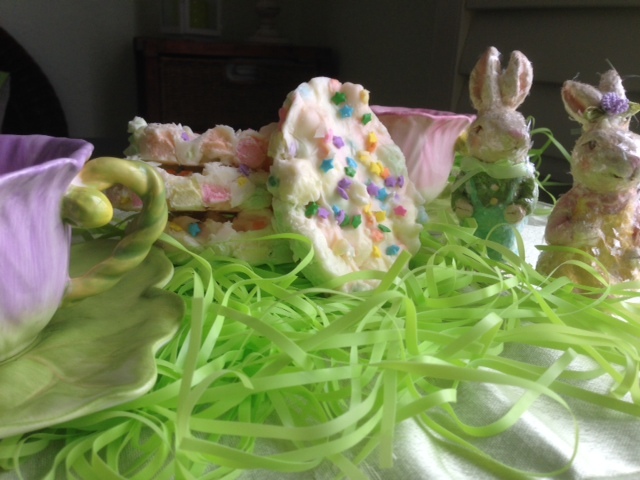 Sprinkle colored Easter grasses around and drop in a few pastel marshmallows! so pretty. Try making this, I promise you will love it. If you have a problem melting the white chocolate chips you can add about 1 Tablespoon of shortening (optional, but it really makes the melting process easier) The white almond bark does not need any assistance as it melts smoothly. I actually used both but no shortening. Melt white bark or white chocolate in microwave in 20 second bursts, stir to make sure the chocolate is melted thoroughly, it can sometimes seem the chocolate is not melted but in reality it is. Mix in colored marshmallows, quickly coating and place in a parchment lined sheet pan. Pop in the freezer for 30 minutes to chill so marshmallows do not melt. Cut into squares or in different shapes with cookie cutters. You have to try this recipe. Quick and easy and taste is sooooo good. The Captain really likes this candy as do many of our friends. I like to incorporate the Easter egg shape and the bunny head into a tablescape announcing Spring and Easter. « Spring And Birds Of A Feather Can Jumpstart Your Home Into Spring!